How to get there: This mountain is located directly north-east of the small village Terskol in the Baksan valley, Caucasus. See the entry under Elbrus, 5642 meter, in order to travel to the Elbrus area. One can most likely access this peak directly from Terskol, I heard that the local farmers may be quite unhappy if they see people crossing "their land", the lower slopes of the hillside. I started out directly from the building where I stayed, it is marked as "medical building" on the map, about one kilometer down the road from Terskol and on the north side (that is a little west of the side road to Cheget). This is the only building on this side of the road in the nearby area. Locally, this building was known as the "MBS-building". Route description: From the building, go north among some trees (that is directly towards the hill), cross the river on a bridge and climb across a locked gate. On the other side, exit right through a wooden door/gate and bypass a small vegetable garden carefully. Continue a bit downstream and locate a possible way up the first, steep section of the hill. I reached the grassy hill at elevation 2123 meter, coordinates N43:15.089, E042:31.596. It may be somewhat easier to gain the grassy slope a bit further downstream. The point 3134 is a distinct, local hump along the ridge, while the 3390 elevation marks the last grass, above there are rocks and gravel only. Continue up and aim for a point slightly to the right of the highest point on the horizon. As you reach the top ridge, you will find that it provides easy access to the highest point, to the left. This point has a small cairn and is also marked with a pole. The elevation is 3531 meter, location N43:16.278, E042:32.425. At this point one discovers the summit ridge going north towards Soldatsky pass (3383m) connecting to the higher peak Sarykolbashitersak, 3776 meter. The next high point along the ridge, that I will call the middle summit, is clearly higher. A short (YDS) class 3 pitch up a steep, but relatively easy rock will get you there. The elevation of this point was measured to 3540 meter with coordinates N43:16.304, E042:32.429. However, once on this top one observes that the next summit, which I will call the north summit, seems even slightly higher. The route there looks a bit tricky, but turns out easier than it looks. Descend to a big block on the ridge, bypass this on the right side in stable, but interesting terrain. Regain the ridge, then continue slightly on the left side of the top ridge before reaching the summit. This point is marked with a wooden pole. One can see directly down into Soldatsky pass, so there are no more high points along this part of the ridge. The elevation was measured to 3543 meter, coordinates N43:16.344, E042:32.447. Thus, this point is taken to be the true summit of Itkolbashi. 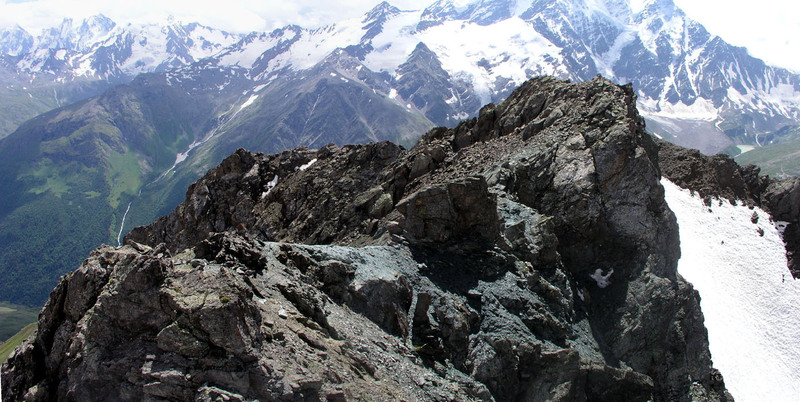 Comments: This was my last day in the Caucasus, a good climb with limited time available. The climb took 3 hours up and 1.5 hours down. I spent about 30 minutes exploring the three local summits along the top ridge. 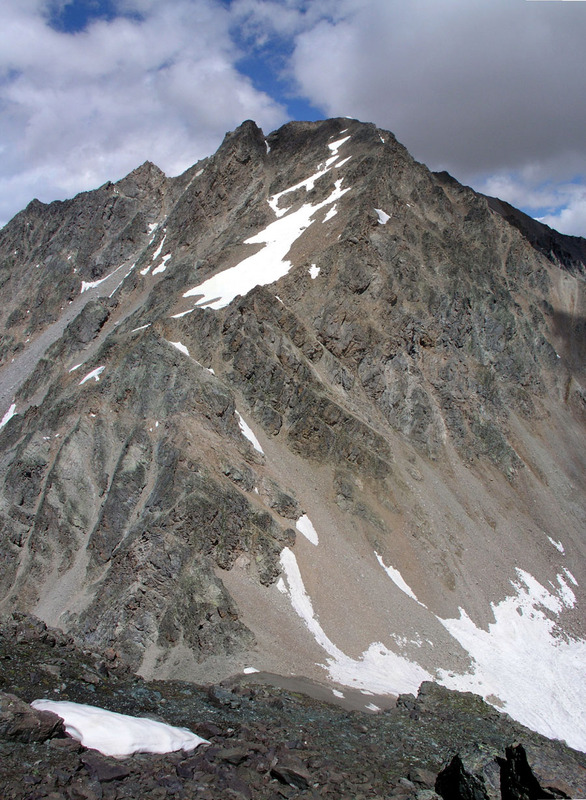 It is likely and consistent with the GPS measurements that the lower summit point (the south point) at 3531 meter is the elevation marked on the map. This makes some sense, as this is the highest point that can be seen from Terskol and the Baksan Valley. The three summit ridge elevations have been adjusted downwards by 5 meter compared to my actual GPS readings, as the GPS seemed to show a bit high in the area and in order to match the map elevation of 3531 meter. The route to the south end of the summit ridge is (YDS) class 2. 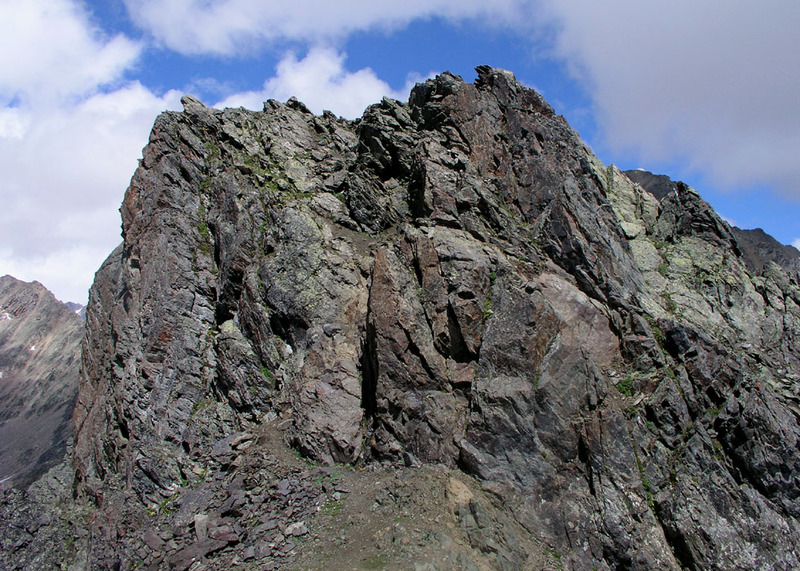 The (YDS) grade of 3 has been assigned because of some easy scrambling along the summit ridge. Panorama view, from the summit of Itkolbashi. The valley with several glaciers at the upper end, is Adylsu, where we hiked on August 6th. Sarykolbashitersak 3776 meter, above Soldatsky pass as seen from Itkolbashi. The middle summit, as seen from the south summit. The route goes up near the distinct shadow. The ridge from the (north) summit back to the middle summit. 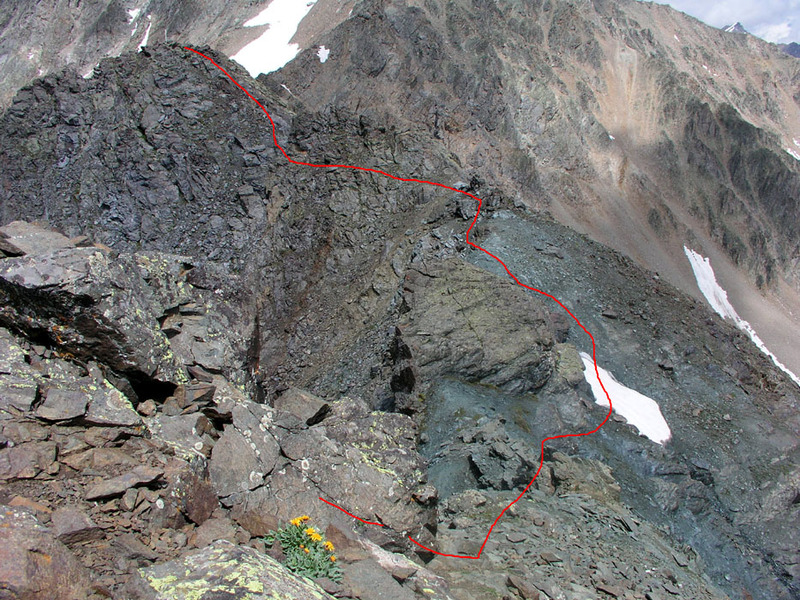 The route from the middle summit to the highest (north) summit.